Cpl. Mike Kubina (standing) watches Sgt. 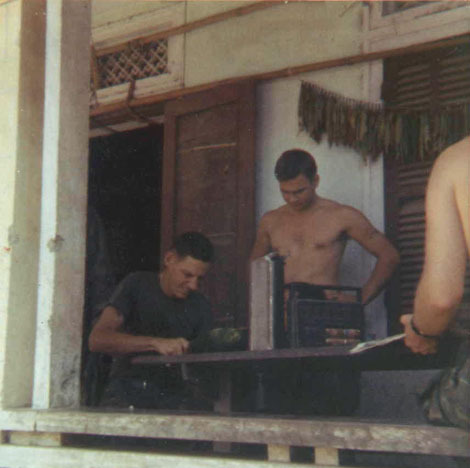 Allison Burd slice a watermelon at a table on the front porch at “The Kitchen.” The tall, green object on the table in front of Kubina may be one of the inserts used to deliver hot food from 2nd CAG. Just in front of Kubina’s left hand is our beat-up old radio, no doubt tuned to AFVN. Tobacco leaves are hung to dry on a string behind Kubina.